Through a range of mentoring programmes, we support young people in gaining an insight into the world of work, raise their confidence and aspirations and develop their skills in CV writing and attending interviews. Our mentoring programmes involve either study support sessions delivered by university student volunteers, short term mentoring (structured around a work experience placement) or long term mentoring (for young people who are not in education, employment or training and lasting at least 6 months). 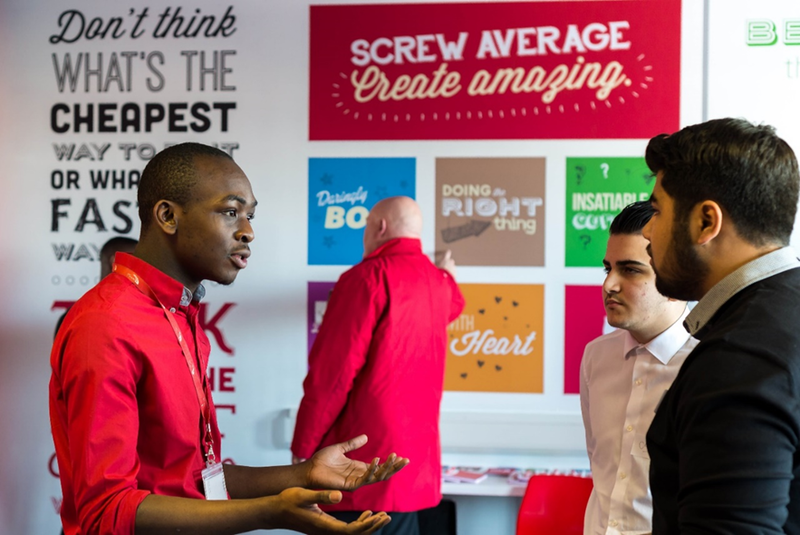 In 2016, we will be matching 100 young people with mentors to support their career development. We work in partnership with a wide range of local businesses and organisations to provide our young people with work experience opportunities. The programme is aimed at young people from disadvantaged backgrounds who might otherwise find it difficult to access work experience opportunities or professionals in their network of family or friends who can advise them on career choices. The programme supports young people to develop their skills through practical work placements and employability skills workshops. Each young person is matched to a mentor from an industry they are interested in, who advises and supports them in planning their future careers, as well as inviting them into their workplace for practical work experience. After the placement, young people take part in employability workshops to help them identify work-place and transferrable skills developed through their placements, and articulating these through presentations, interview style questions and leadership activities. Young people aged 16-24, who are currently not in education, employment or training (NEET), or at risk of becoming NEET, are carefully matched with a mentor who can offer advice and guidance in helping them find the right career path. Each mentor and mentee commit to working together for a minimum of six months. The pairs meet every week for the first month, and then every two weeks, with regular phone or email communication between meetings. The programme provides young people with the tools they need to take charge of their future and make the transition into apprenticeships, business start-ups and other employment and training pathways. Mentors and mentees continue to meet until the young person has moved into employment, training or further education and has sustained this for at least three months. Fitzrovia Youth in Action works in partnership with Westminster Kingsway College (WKC) to deliver a study support programme which aimed to improve academic grades and raise aspirations. University students are recruited from a range of London’s top universities such as UCL, SOAS and LSE and are supported in running drop-in sessions with the WKC students. Volunteers specialise in a range of subjects such as maths, chemistry and politics, covering all A Level subjects. The study support sessions offers students practical help and advice as well as providing an inspiring environment to help build confidence, expand knowledge and raise aspirations. Students work in small groups or receive 1:1 tuition. They can choose to have assistance with anything from planning and structuring an essay, help with revision techniques or examination practice prior to exams. We work with with local businesses and organisations to put on networking events for young people. At these events, they have the opportunity to talk to different employees about their job roles, practice interview skills and get advice on what skills and experiences employers are looking for. Levi’s journey with FYA in 2016 – In this short film Levi talks about his journey through Fitzrovia Youth in Action’s programmes. Closed Doors – Outlines the challenges and barriers a young person encounters when trying to find employment. This video clip follows Jordan and his efforts to find employment, going into businesses and attending interviews. FYA Work Experience – Daniella, a young person, talks about her experience of doing work experience at Sainsburys in Tottenham Court Road. Daniella shares how the work experience has helped teach her to be more responsible, learning about good customer service and helping her to be more open with people. Her work experience mentor, Sheliza, shares how much she has enjoyed hosting Daniella and how she has seen Daniella grow in confidence. Sheliza also reflects on her own experience and struggles in getting employment and how frustrating this can be for a young person. FYA Networking Event – FYA hosted a speed networking event which sees young people meeting professionals from local businesses, asking questions, sharing experiences and learning about the working life. The clip share a young person’s perspective (Syed) of before and after the event. Syed also shares how FYA has helped him. Creating Change: Employability – The video tracks how negatives can become positives exploring different perspectives of young people and tracking their journey with FYA with specific focus on four young people: Rebecca, Daniel, Ben and Ramone. All four young people talk about how through the programme at FYA this has enabled for them to develop things like confidence, interview skills and recognising positives about themselves.